The Ayn Rand Institute has recently introduced a new set of YouTube videos, many of them hosted by Dave Rubin, called "Objectivism on Happiness." The videos give an insight in how a new generation of "orthodox" Objectivists are framing (or rather re-framing) Rand's ideas. In what I've heard from Yaron Brook, Greg Salmieri, Onkar Ghate, and Tara Smith, there seems to exist a drive to portray Rand's philosophy in such a way that it does not come into conflict with the sciences of human nature. Ayn Rand believed that human beings were, at birth, "blank slates," and that it was through exposure to philosophical premises that they developed personalities and character. 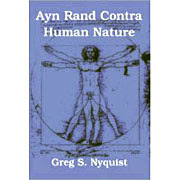 The strategy that this new breed of Objectivists appear to have concocted to separate themselves from this embarrassing doctrine is to make it clear that, while they have no intention of explicitly denying the possibility of heritable traits of character, they nevertheless continue to insist that, through the use of "reason" and "free will," they can achieve Rand's vision of the self-created man.